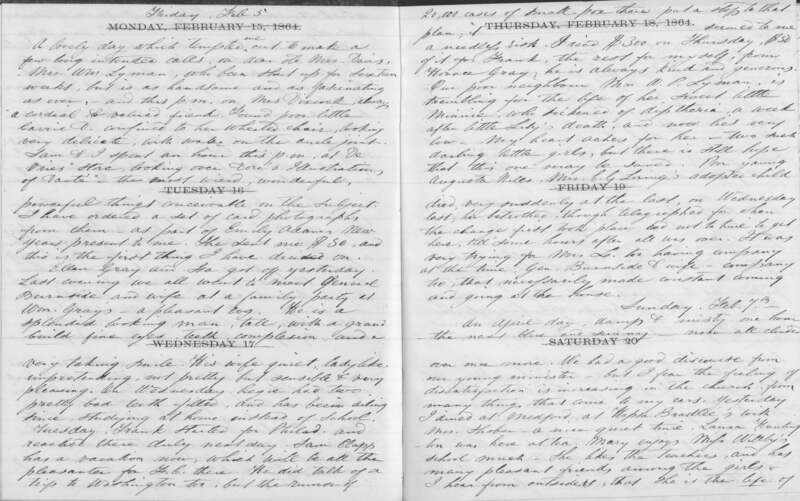 For the last year or so, I’ve been immersed in the diary of Regina Shober Gray (1818–1885), a Philadelphian who lived on Beacon Hill in Boston for more than forty years. 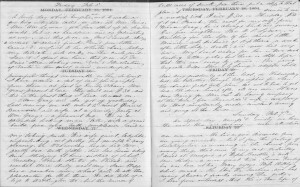 During my sabbatical in 2015, I read Bob Shaw’s transcripts of the diary for the 1860s and early ‘70s; later, I reviewed PDFs of the diary volumes for the last decade of Mrs. Gray’s life. At some point in the process, I became aware that the Maryland Historical Society had a photo of Mrs. Gray, but it was only a looming American Ancestors cover story deadline that reminded me that it might be nice to see an image of the diarist. Given my fascination with Mrs. Gray, I really cannot account for my lack of curiosity! In any case, her photo arrived recently. 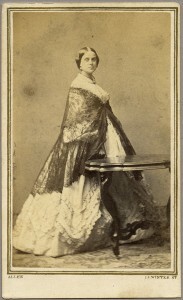 It shows a handsome woman in elaborate dress standing beside a table, her arms in puff sleeves and covered by a lace shawl. The mount is stamped Allen, on Winter Street in Boston, and Edward L. Allen, daguerreotypist or photographist, had his studio at 13 Winter Street ca. 1860–ca. 1865. Mrs. Gray generally noted the dates on which she was (or her children were) photographed, but I can find no reference to Allen in the 1860s volumes of the Gray diary. The provenance of this photo – in the Carey and Kimber Families Photograph Collection at the Maryland Historical Society – suggests that it was created to be sent to Mrs. Gray’s cousins in Baltimore, the family of her paternal aunt, Joanna Sophia (Shober) Kimber (1794–1845); Susanna Budd Kimber (1822–1913), Mrs. Gray’s first cousin, married James Carey in 1850. The Carey and Kimber collection includes many images of the Kimber and Carey families, as well as Mrs. Gray’s sister Elizabeth Kearney Shober (1819–1865), her son Morris Gray (1856–1931), (probably) her daughter Mary Clay Gray (1848–1923), (probably) her aunt Regina Shober (1786–1865), and the mystifying “Mary Shober Gray.” While members of the Gray, Shober, Kimber, and Carey families found their way variously from Boston to Philadelphia to Baltimore, sending one another daguerreotypes or other images was an easy way to stay in touch. Vividly as Mrs. Gray’s words paint a picture of her life (and a faint self-portrait), having an image of the diarist to place in the bustling streets of Beacon Hill gives me a new sense of this complex Victorian lady. With special thanks to Maureen Taylor (The Photo Detective) for consulting on Allen and the dating clues in Mrs. Gray’s dress and hair style. Or Mrs. Gray’s mother-in-law, Mary Clay (1790–1867), who was married to William Rufus Gray 1809–31. This could also be an image of Mrs. Gray herself, taken before her marriage in 1844. Both aunt and niece were named Hedwiga Regina Shober for Hedwiga Regina Schubert, wife of Andrew Shober (1710–1792). Perhaps another way of denoting Mary Clay Gray the younger. What does ICYMI stand for? ICYMI means “in case you missed it,” and generally refers to something previously published. When I saw this photo, I knew exactly where it was taken, since I have three family portraits taken with the same table! The portraits are of three daughters of Nantucket whale oil merchant Henry Coffin and his wife Eliza (Starbuck) Coffin, who was the sister of my great-great-great grandmother, Lydia (Starbuck) Athearn.